When asked how he won the race for North Carolina governor in 2012, Republican Pat McCrory has repeatedly boasted to the national media that it's because he ran a "clean" campaign. As McCrory told MSNBC, he "did not run one negative TV or radio ad against our opponent." Of course, McCrory didn't have to run negative ads; super PACs and outside attack groups did it for him. In 2012, super PACs and other outside spending groups -- those not officially tied to a candidate or party -- spent more than $14 million on state-level races in North Carolina, according to an Institute for Southern Studies analysis. By far the biggest-spending group in North Carolina was the Washington, D.C.-based Republican Governors Association, which unleashed $4.9 million in ads aimed at McCrory's Democratic challenger, Walter Dalton; the RGA's first TV spot berated Dalton for his "high tax" and "job killing policies." RGA was joined by Real Jobs N.C., a group co-founded by Art Pope and other GOP donors in 2010 which spent more than $430,000 in 2012 to help McCrory in the governor's race -- including direct mail attacking Dalton and Democrats over debt, schools and "Obamacare." Altogether, outside groups spent $8.1 million in North Carolina's gubernatorial race, making it the biggest magnet for outside spending -- and more than two-thirds came from conservative groups to help McCrory's "clean" campaign. While the debate continues over whether super PACs wasted their money on races for the White House and Congress, the Institute's analysis shows outside spending groups played a key role in North Carolina state races. The Institute has been tracking independent election spending in North Carolina at FollowNCMoney.org, a website that draws on state and federal election filings. The site now has records of more than 720 expenditures totaling $14.3 million aimed at state-level races for 2012. 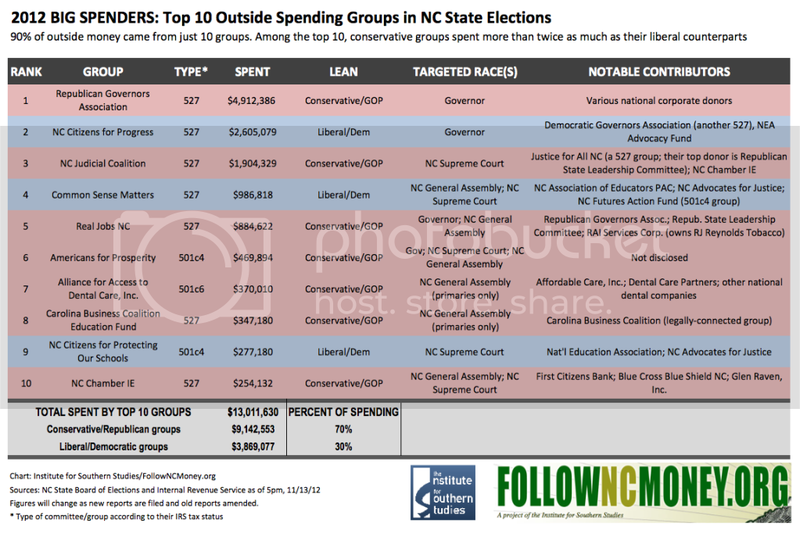 * Top Spending Groups: 91 percent of the outside spending on North Carolina state races came from just 10 groups. Seven of the top 10 are conservative/Republican-leaning committees; three are liberal/Democratic-leaning. * Big Republican Advantage: Among the 10 biggest-spending committees, 70 percent came from Republican-leaning groups and 30 percent from Democratic-leaning organizations. * NC Supreme Court Race: As McCrory pulled ahead in the governor’s race, outside money swung to the N.C. Supreme Court contest -- officially nonpartisan -- between Republican-favored incumbent Paul Newby and Democratic-favored challenger Sam Ervin. So far, $2.6 million in spending has been reported for the race, with 88 percent supporting Newby and just 12 percent benefiting Ervin. The biggest outside spender in the N.C. Supreme Court race was the N.C. Judicial Coalition, which has reported $1.9 million in expenditures. The group's largest donor is another super PAC, Justice for All NC, which has received more than $1.1 million from the Republican State Leadership Committee. As recently as October, Republicans feared Newby could lose his seat on the state Supreme Court; one poll days before the election showed Ervin with a small lead. But Newby ended up winning 51.9 percent of the vote, part of a conservative sweep that included winning the governor's mansion and strengthening GOP majorities in the General Assembly. Due to a loophole in North Carolina's campaign finance reporting laws, the total amount spent by outside groups won’t be known until January 2013, when committees submit their final reports for 2012. The amount still to be reported could be substantial. For example, N.C. election board records currently show zero money spent by for Justice for All NC, a conservative super PAC. However, an Institute analysis of TV station records show the group spent at least $117,525 in November buying TV ads to support N.C. Supreme Court candidate Paul Newby, who received more than $2.3 million in support from outside groups en route to his victory.